Syracuse Crunch forward Steve Kelly puts in the wining Shoot-Out goal past Grand Rapids Griffins goaltender Jimmy Howard. Attended an American Hockey League game last night with the Grand Rapids Griffins visiting the Syracuse Crunch. The teams battled to a 1-1 tie through regulation and overtime. The game was decided on a Shoot-Out with the Syracuse Crunch getting 3 goals to the Griffins 0. Above is the game clinching goal by Steve Kelly (11) of the Crunch sliding the puck between the pads of Griffin’s goaltender Jimmy Howard (33). 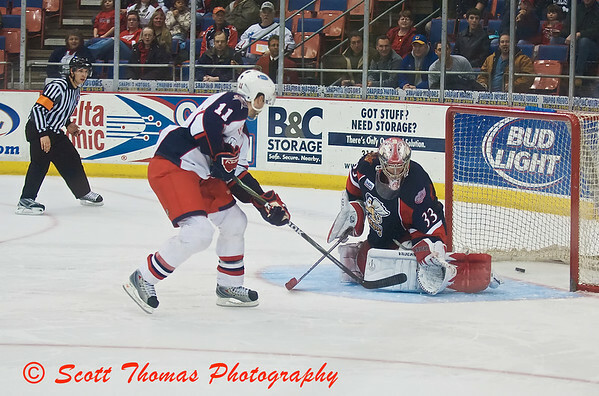 This entry was posted in Sports and tagged ahl, crunch, hockey, ice, new york, Photography, shoot-out, syracuse, war memorial. Bookmark the permalink.